Be the first to share your favorite memory, photo or story of Cortney. This memorial page is dedicated for family, friends and future generations to celebrate the life of their loved one. Cortney Paige Whitecotton, age 25, life long resident of Ponca City, passed away peacefully on Monday, January 21, 2019 at her home. A Memorial Mass of Christian Burial will be held at 10:00 am, Friday, January 25, 2019 at St. Mary's Catholic Church with Father Carson Krittenbrink officiating. 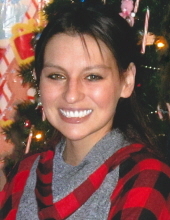 Following the Mass, Cortney will be laid to rest at Resthaven Memorial Park in Ponca City. Cremation arrangements are under the direction of Trout Funeral Home & Crematory. Cortney was born on March 8, 1993 to Samuel Whitecotton and Suzanne Louise Goff Whitecotton in Ponca City, OK. She was raised in Ponca City, attending Ponca City schools. Cortney was a determined and strong willed young woman. This was evidenced by her performance as a Po Hi Cheerleader. While still yet a sophomore in high school, Cortney was accepted to cheer on the varsity cheer team, a feat unheard of for an underclassman. Throughout her life, Cortney was known for here friendly ways and sharp wit. After high school, her life changed when the light of Cortney's life, Harper Lynn McNew, was born. Cortney's love for Harper was clear in the way the two played together as well as how much time and energy Cortney invested in her daughter. Cortney will be dearly missed by those who knew and loved her. Survivors include her adored daughter Harper of the home, parents Suzanne and Samuel Whitecotton of Ponca City, sister Brooke Yvonne Ivie and husband Will of Pryor, OK, maternal grandparents Don and Audrey Goff of Ponca City, paternal grandmother Yvonne Bagby of Earlville, IL, aunts and uncles: Steve and Sandy Whitecotton of Sugar Grove, IL, Jackie and Scott Raabe of Katy, TX, Carol Goff of Ponca City, Stacie and Lonnie Stephens of Katy, TX, Tracie Ann Goff of Mansfield, TX, nephew and niece Cohen and Kendall Ivie of Pryor, OK special person Justin McNew of Ponca City as well as many cousins and dear friends. Cortney was preceded in death by her paternal grandfather Jack Whitecotton and uncle Guy Whitecotton. Memorial Contributions may be made to St. Mary's School, 415 S. 7th St., Ponca City, OK, 74601. To send flowers or a remembrance gift to the family of Cortney Whitecotton, please visit our Tribute Store. "Email Address" would like to share the life celebration of Cortney Whitecotton. Click on the "link" to go to share a favorite memory or leave a condolence message for the family.